Nashville singer/songwriter Louise Mosrie is one of the six 2009 Kerrville New Folk winners. Her songwriting can pinpoint the details of life and its larger truths all at once. Her songs live in the odd twists and turns of the road. Soulful Americana Folk Pop - Louise is a singer/songwriter based in Nashville. Her show consists of her original songs. Louise grew up in McEwen, Tennessee and moved to Knoxville to attend college. But it wasn’t until after school, on her 22nd birthday, that she realized that music was too important to set aside for a more “practical” career. Borrowing her brother’s Sears Harmony guitar, she taught herself a few chords and wrote her first song. 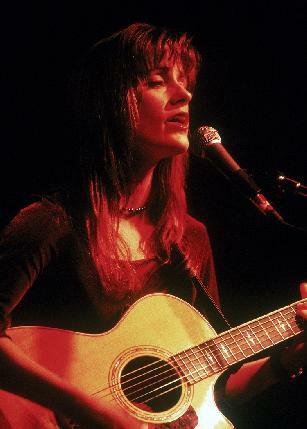 She joined a couple of bands and sang lots of cover songs by artists she admired like The Sundays, Everything But the Girl, Nanci Griffith and Ricki Lee Jones, but only writing her own songs gave her creative satisfaction. In 1999, she released “Crave” as a full-length debut album. The album received local and regional critical praise. Louise then started playing solo around the Southeast to coffeehouses, festivals, and bookstores…anywhere she could garner a listener, a fan, or another contemplative soul to sing to. Since then she’s played at Eddie’s Attic in Atlanta, the Bluebird Café, Douglas Corner and Exit/In in Nashville, Blue Cats and Barley’s in Knoxville, the Coffee Underground in Greenville, SC, Kerrville Folk Festival and the Atlantis Music Festival. She’s been honored to open for such diverse acts as Jonatha Brooke, Allison Moorer, Marcia Ball, Michelle Malone, Greg Trooper, and Antigone Rising. Louise has just released her 3rd full length album, “Home”, produced and engineered by Nashville veteran Jon Young. This CD reflects the changes in her songwriting since moving to Nashville – moving Louise into a more Americana genre. "It's a little like coming home again", she said. "I spent so long trying to get off the farm and now all I want to do is go back! My songwriting is really reflecting that."